1. Saute the bacon in a pan until browned, add onion and cook a few more minutes. Do not add the onion until the bacon is brown! 2. Add bacon and onion to crock pot along with clams, celery, clam juice, broth, salt, dill, celery salt and pepper. 3. Cook on high for 3-4 hours or low 6-7 hours. 4. During the last hour add cream. Mix cornstarch with milk and add to slow cooker. Stir in butter. Chowder is done when warmed through and thickened to your liking. Serve with fresh parsley. *Try a vegetarian version by omitting the bacon and using vegetable broth! Prep ahead: Do steps 1 and 2 the night before and put the pot in the fridge. It only takes about 15 minutes! 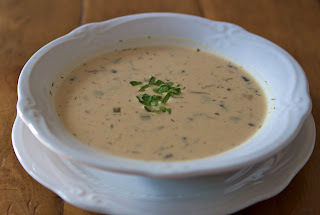 Copyright © PrepAhead and Dine In: slow cooker new england clam chowder. All Rights Reserved.